Back when Alex and I were first dating I was all about a date night. We were young and didn't have many responsibilities and we would spend one weekend night drinking [heavily] with our friends and the second night venturing out to great restaurants all over Boston and then Chicago for a date night. Fast forward several years and we're married with a puppy and a mortgage and weekends look a little different. Friday night is usually spent winding down-- making dinner together at home and relaxing with a drink, the dog, and a movie. Saturday night is still date night, but it has changed too. Fancy and trendy places are a more rare treat now in favor of cool laidback places with great food and often the great company of other couple friends. We have recently discovered some amazing places for date and double date nights around Chicago that I want to tell you more about. No white tablecloths here-- just great food, cool cocktails, and fun atmospheres. Exactly what I am looking for on date night lately-- and maybe for an upcoming Valentine's date too, right? Here are two of my new favorites. Come back on Thursday for two more suggestions! I don't get to Pilsen very often, but it's a really cool up and coming neighborhood and Dusek's has really put it on the map. The menu at Dusek's is eclectic and cool with tons of fun twists on local Midwestern ingredients and dishes, a big focus on seafood, and an awesome beer list. While sommeliers are commonplace at upscale and trendy restaurants now, a cicerone (a.k.a. a certified beer expert) is still a rare find. Dusek's has one on staff, which ensures that not only is their beer list pretty off the charts, but no matter what you order you'll have a spot on beer pairing too. Before I tell you about the food, let me make a quick confession: We joined our friends Nick and Tara at Dusek's for a date night a while ago... like, saying this was a 'recent' visit is kind of a lie. And since Dusek's menu changes seasonally, these items are likely not available right now-- at least in the same form that we enjoyed them. That's not to say that the food wasn't great, just that you'll probably find a new and exciting menu when you visit. Alex and I love dining with Nick and Tara because they also love food-- and we often order tons of stuff to share. At Dusek's, we started with wood roasted cheddar-stuffed pretzel. The pretzel was huge, warm, and soft and served with a tangy beer mustard sauce for dipping. Next up: the brandade fritters. I wasn't totally sure about these given that brandade is salt cod (not my favorite), but these were surprisingly tasty little bites. They were lightly breaded and crunchy, served with a little bit of flavorful romesco sauce and lemon relish-- a perfectly bright complement to the salty savory fritters. We all agreed that our favorite starter of the evening was the blue crab dip. Served with deliciously soft and fresh rolls for dipping, this creamy melty dip was packed with cheese and chunks of crab, topped with a yummy artichoke relish. We actually contemplated a second order, but opted not to based on the sizes of the entrees we saw around us. Another high point of the meal: the duck fat frites. They were perfectly crispy and the duck fat frying made a standard french fry even richer. The frites were served with a harissa ketchup that was the perfect blend of tangy, sweet, and spicy-- a nice complement to the rich and savory fries. Since there was a lot of cheese and fried food happening, Tara and I decided to add something green to the mix. We chose the asparagus salad made with Little Gem lettuce, shaved Pecorino cheese, red onion-caper relish, all tossed in a light and tangy Meyer lemon vinaigrette. This refreshing salad was a nice light break from some of the heavier items we were sharing. For entrees, Alex ordered one of his go to's: the lobster roll. Their cold lobster salad was served with lettuce on a huge buttered New England-style bun. The sandwich was served with their delicious duck fat frites and good news-- it's on their menu right now! It is currently being served with beef fat fries... yum. I opted for something more season at Dusek's: the tempura fried soft shell crab. I am sucker for crab-- and love soft shell since you can only get it for such a finite window of time each year. The tempura treatment was so great here since it kept the crab light and crispy. It was served with a fingerling potato salad, saffron preserved lemon aioli, and peas shoots. It was such a fresh combination of flavors. Dusek's can be tough to get into, but it's worth the wait. Put your name in for a table and head downstairs to Punch House. This bar is kitschy and weird and reminds me of my grandparents' basement game room-- in a good way-- but the cocktails are eclectic and strong. Cheers! Three Aces describes itself as "the Italian countryside meets the American farmhouse... in Keith Richards's basement bar," which seems pretty accurate. Three Aces is located in Chicago's Little Italy neighborhood and it's definitely not your typical Italian pasta joint. It's more of a cool rough around the edges biker bar meets gastropub with a menu full of delicious Italian-inspired and reinvented bar food. We visited late in the summer and sat out on their expansive patio, which was so cute all lit up at night. And a perfect place to enjoy food, drinks, and conversation with friends. As we usually do when we dine out with Nick and Tara, we ordered several items to share. 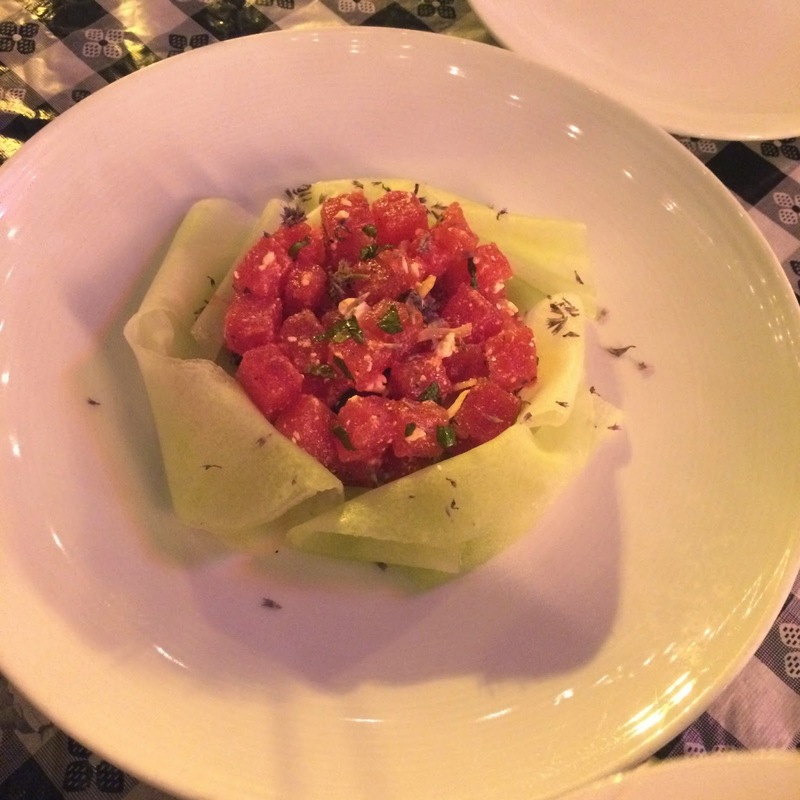 We started with a fresh and summery watermelon and honeydew salad-- by far, the lightest dish we enjoyed that night. Fresh watermelon, thin ribbons of honeydew, fresh herbs, and feta were tossed in a light vinaigrette. It was so perfect for a summer night on the patio. We also shared a cheese and charcuterie board which has a very rustic Italian feel at Three Aces, served on a slab of rough cut wood. The selection on the board at Three Aces changes often and features some really unique offerings like duck liver pate, pickled snap peas, mortadella, spicy stone ground mustard, and a variety of unique meats and cheeses served along with a basket of rustic crusty Italian bread. The highlight of our shared items-- and of the entire meal-- was definitely the Bolognese fries. 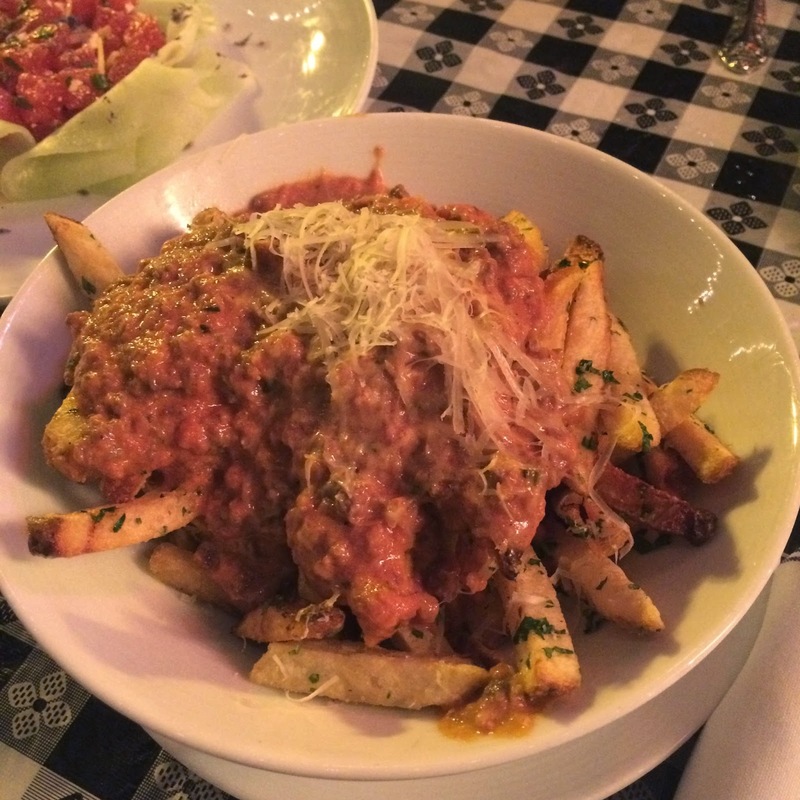 A big bowl of french fries were generously topped with housemade bolognese sauce and melty grated parmesan. It was like a big bowl of pasta with meat sauce met cheese fries and made the most delicious and decadent fries. Ever. If this doesn't sum up "the Italian countryside meets the American farmhouse... in Keith Richards's basement bar," I don't know what does. Even if you're heading to Three Aces just for drinks, be sure the get an order of these (and a fork because they are crazy messy) and enjoy! Alex decided to order from the Three Aces Pizzetta menu. 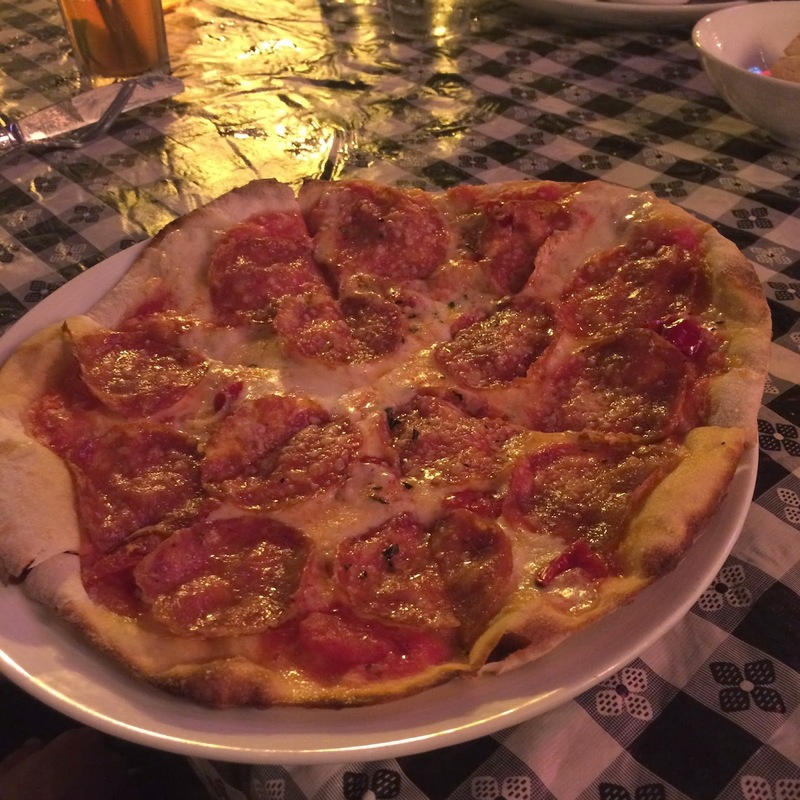 Three Aces offers a great selection of thin crust pizzas, perfect for sharing or for a main course. The spicy Calabrese pizza is topped with salametto calabrese, calabrian chili, oregano, mozzarella, and Parmesan. As you know from above (and several other restaurant posts at this point), I am a huge fan of crab. I ordered the king crab gnocchi, which was a surprisingly refined, but super rustic dish. Soft fresh gnocchi was topped with huge chunks of king crab, fresh sweet corn in a rich buttery broth. It was topped off with crunchy pea shoots. Gnocchi can seem so heavy, but this dish felt light and summery with great sweetness from the corn and crab. It was really well done and I would absolutely order it again. Stop back on Thursday for two more great options for a laidback date night in Chicago!